Back and neck pain can be absolutely horrendous to live with depending on the severity of the sufferer. It is estimated that around 8 in 10 people will at some point suffer from back and neck pain in their lives, that is 80%! Back pain can be caused by a number of different factors, from poor posture all the way through to work related pain. There are many different exercises that can help to alleviate back and shoulder pain but modern technology can do a better job. Back and neck pain is such a common problem that many of us share in our modern working world. All the different jobs and activities that we take part in increase our chances of suffering from it at some point in our lives. The effects of working a manual job with heavy lifting. Short term pain from work or sports. These are just a few of the main reasons however their could be so many others. Your first step should always be to consult a GP or doctor. They will be able to work to diagnose what the underlying issue is and then provide you with a plan and pain relief. Once you have done that you will now be in a position to try a TENS machine to provide short term pain relief for you back and neck pain. Using a TENS Machine to treat back and neck pain. A TENS and Ems machine works by firing small electrical pulses through sets of sticky pad electrodes into the skin. When used on a more powerful Ems setting these pulses can reach into the muscle tissues causing them to contract. If the TENS machine is set on the right mode and frequency this can have a massaging and soothing effect on the areas of the back and neck that hurt. As well as this a TENS machine also stimulates the nerve endings which causes the pain signals to be either redirected or stopped from entering the nervous system altogether. When the nerve endings are stimulated this way the body can also release Endorphins. This is an important aspect in the pain relief as Endorphins are the bodies homemade natural pain killer. With all of these factors working together mild to severe back and neck pain can be managed and minimised. The benefits of using a TENS unit for back and neck pain. There are many reason why using a TENS machine for your back and neck pain could be beneficial to you. One of the biggest reasons for me personally is that it provides a natural way to relieve the aches and pain. I absolutely detest taking over the counter and prescription medication unless it is absolutely necessary. They can be highly addictive and generally I try to stay away from putting nasty chemicals into my body. A TENS machine means that I do not need to rely on medication as it provides a drug free way to receive pain relief. Another great reason for using a TENS machine to treat your back and neck pain is because it has so many other uses. Once you have treat your pain your TENS unit is there waiting for whenever it is needed again for any number of different ailments. This makes it a very cost efficient and versatile piece of equipment. How to use a TENS machine for back and neck pain. The process of using a TENS machine for back, neck and shoulder pain is really pretty simple. It is a case of placing the sets of electrodes onto the right place as shown in the picture below. The placement of the electrode pads is not super critical. They can be placed in a closer group or moved further up or down the back as well, dependant upon where the pain relief is needed. Once you have placed your electrodes it is simply a case of turning on the TENS machine and choosing the correct mode which will be described in the user manual. You can then set the power/frequency to a position that you get adequate pain relief whilst still remaining comfortable to use. Now you can enjoy the TENS machine pain relief whilst going about your daily business! Where not to place the electrodes. 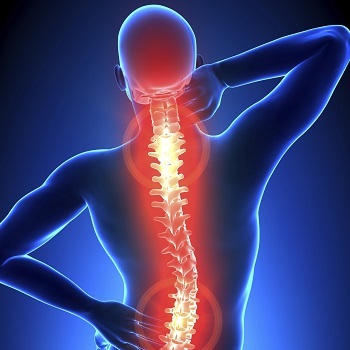 Even though your main pain may be in your neck you should never place the electrodes there. This is because you have some major arteries and nerves running through your neck. Instead it is highly recommended that the electrodes are placed on your high back. Somewhere towards the tops of your shoulder blades will be more than adequate for treating neck pain. 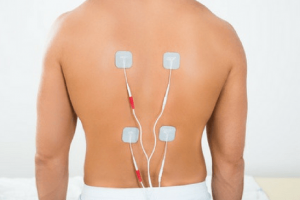 Which is the best TENS machine for back and neck pain? We recommend using at least a dual channel tens machine to treat your back and neck pain. The reason for this is because you want at least two sets of electrodes on your skin to get better coverage and pain relief. Of all the Tens machines we have tested and reviewed here at Tens Machine Pro we like to use the below units to treat back and neck pain. I have listed then to be country specific so that you can click the correct link depending on if you are from the US or the UK. US specific TENS unit for back pain. If you suffer from back and neck pain and are from the US the below TENS machine is the one that we really recommend. The Med-Fit Premier TENS Machine is one of the best on the market and comes at a great price. By clicking the below link you will be taken to the product listing on Amazon which is currently at the best price available. UK specific TENS units for back pain. The Med-Fit 2 wireless tens machine is perfect for back pain. It has nice large electrodes and is completely wireless. This is excellent as it means that you use it comfortably whilst at work or driving. Being able to use your TENS machine whilst on the go can make all the difference. If you would like to view the Med-Fit 2 wireless TENS machine please click the below for Amazon. You will then be able to see more pictures and technical specifications. Or you could also check out our in depth Med-Fit 2 review. We also recommend the use of the Med-Fit Premier EV906 Tens machine for the treatment of back and shoulder pain. The reason for this is because it has a huge amount of different modes and power increments meaning that you will get the best possible TENS treatment. It also features quad channels which means that you can use 4 sets of electrode pads independently on different locations. You can view the price for this by clicking the below link which will take you straight to Amazon. 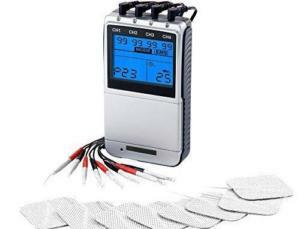 Med-Fit Premier 4 Channel TENS & Muscle Stimulator 24 Pre-Set Programmes & Manual Adjustment for Pain Relief, Muscle Re-Education, Strengthening, Pain Management, Back Pain & Rehabilitation. Or Click here to read our full and in depth Med-Fit Premier EV906 Tens machine review. Whichever TENS machine you choose to treat your back, neck and shoulder pain we wish you the best of luck. By following a set plan from your doctor you should be able to minimise the amount of disruption to your life caused by back pain. Then with the added benefit of a TENS machine you should really see some big improvements.